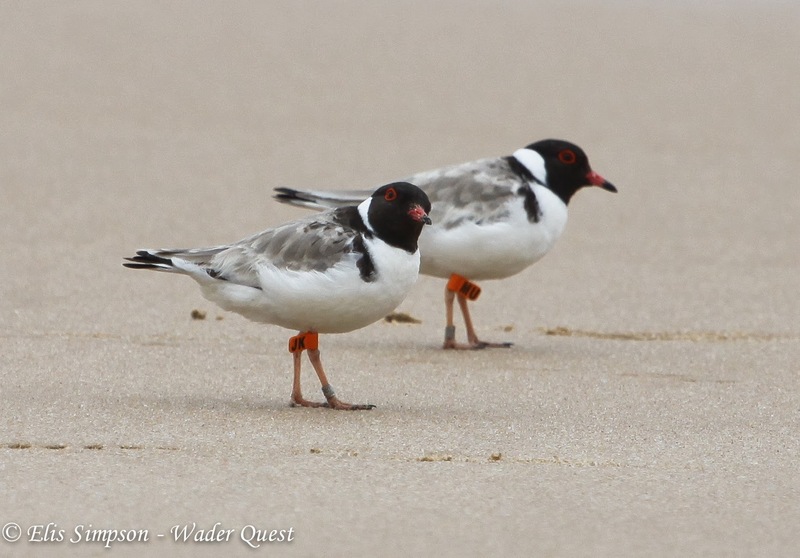 Wader Quest had an appeal to raise £1,000 to send to BirdLife Australia to help them with funding at a time when their government funding had been cut in addition to the £175.00 we took with us to Melbourne last year. In the end we sent an additional £1,128.50 thanks to the generosity of your donations and funds raised by other means. Hooded Plovers on a Victoria beach. Today we received a letter from Grainne Maguire the Coast and Marine Progamme Manager for BirdLife Australia thanking us for the donation and explaining how it has been allocated. Much of the success of BirdLife Australia's beach nesting birds programme has been due to a vast army of volunteers, much good work (raising the fledging rate from 5% to 50% in 6 years) has been achieved in quite simple, yet affective projects and campaigns principally raising awareness among local populations and beach goers. To this end we are pleased that some of our donation has been spent on re-printing the booklet My Hoodie which is used in the training of new volunteers at beaches that have not previously been monitored and newcomers to established projects alike, it is good to know that the funds will have a lasting and practical use. BirdLife Australia's My Hoodie guide for volunteers. These banners are used at busy beach sites after the eggs have hatched, to warn beach users that they are approaching an area with tiny, flightless chicks on the beach. We find they are very effective and can't be missed by approaching people. They are a great cue for people to leash their dogs and to keep to the water's edge. Grainne Maguire, Renee Mead and Meg Cullen, BirdLife Australia staff working on the Beach Nesting Birds Programme. 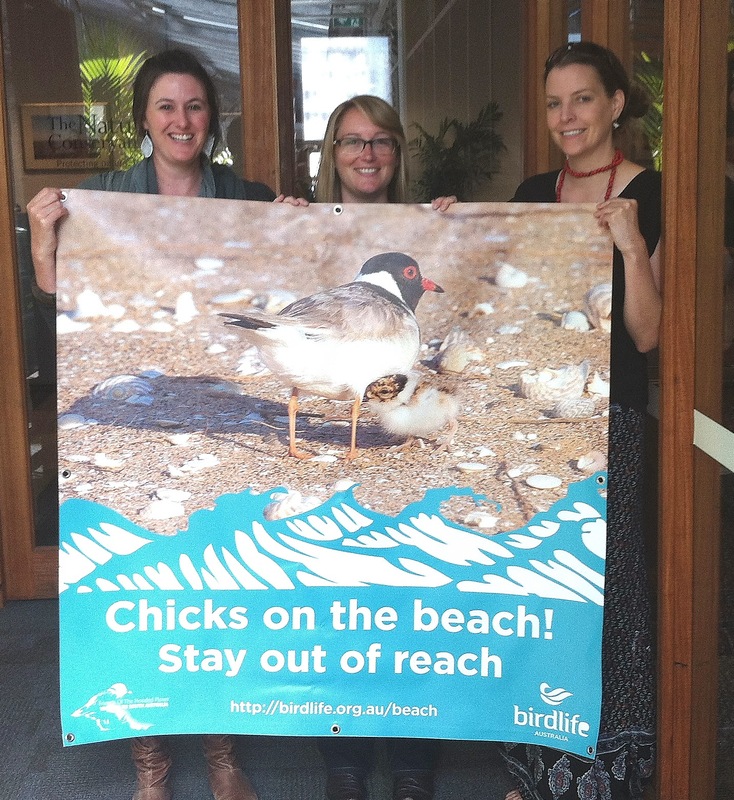 They are holding one of the posters, that you helped to pay for, which will be used to help protect vulnerable Hooded Plover chicks on the beaches of southern Australia. It is very gratifying to know that all the effort we put in and all your generosity and that of our supporters, will make a real difference in a practical way to aid the conservation of one of the world's struggling wader species. We wish Grainne and her wonderful team of staff and volunteers at BirdLife Australia's beach nesting bird programme every success for the future and thank them for looking after these precious birds on our behalf.